Singapore National Day. Perhaps it's my English background, but I find these lavish celebrations of nationhood faintly ridiculous. The place is littered with red and white flags, there's one draped over every balcony of every condominium and under each window of every HDB block, the local petrol station is selling covers for door mirrors in the colours of the Singapore flag and most cars have a lethal looking flagpole stuck on to a window bearing a mini-Singapore flag. (Has anyone released statistics concerning the number of injuries – gouged eyes, pierced chests, scratched arms – caused by these in accidents?) Today's paper forgoes any news to give us "feel-good" stories about how lovely it is to live in Singapore, and the whole place will shortly come to a standstill as the place erupts in a mass celebration of this insignificant milestone in a very young country's progress (46 today). It was even dafter in Malaysia where they celebrate with even greater abandon; and there they don't even celebrate the anniversary of the forging of the current nation, merely the anniversary of the day on which the previous colonial power left. One thing these national day celebrations have in common is some pretty dreadful music. If you venture out in public your ears are assaulted by various over-amplified examples of musical mediocrity projected as examples of how Singapore is breeding fine musical talent (forget the fact that the finest home-grown musical talent has gone to Scotland for the month – see my earlier post). Worst of all will be the dreadful versions of the national anthem blasted out at every opportunity. It is standard procedure for countries to have a national song and one of the first acts of new nationhood seems to be to find a suitable one. 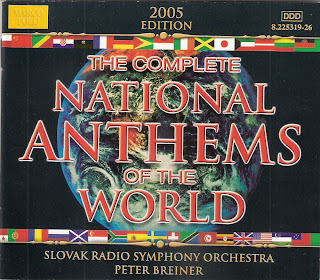 In 2005 Marco Polo produced an 8-CD set of all the National Anthems of the World; 375 tracks in all, although the national anthems represent just 273 nations some of which are not quite what we might think of as sovereign states. One of the games visitors to the Rochester Rotunda are subjected to is to be played a national anthem and to guess the country. 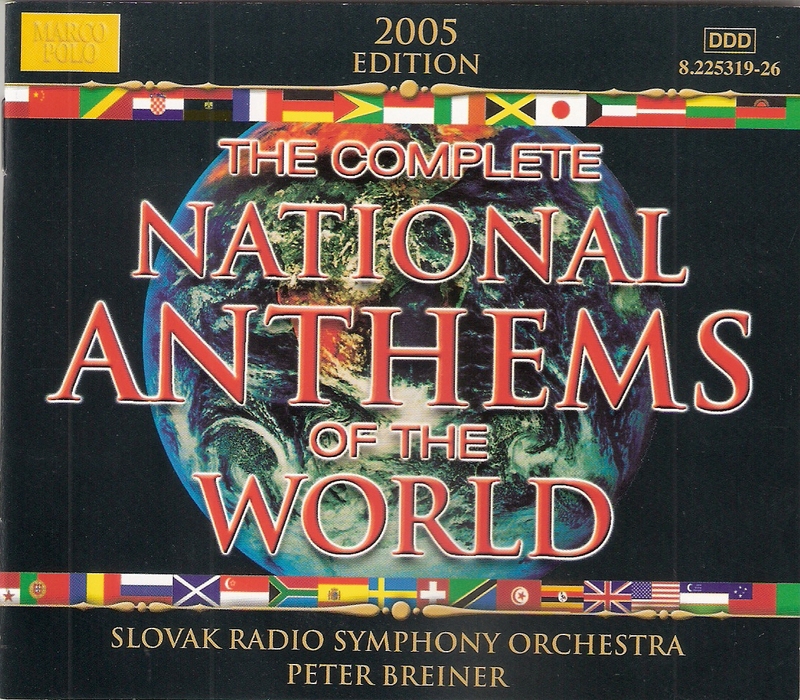 It's fun, not least because the performances by the Slovak Radio Symphony Orchestra under Peter Breiner render even the most familiar anthems virtually unrecognisable, but particularly so since few of the tunes have any obvious correlation with the country they are serving. National Anthems rarely have music written by a native of the country concerned. When I wrote about the Malaysian national anthem for the performance given (amidst, it has to be said, a certain amount of controversy which the world's press picked up) at the inaugural concert of the MPO in 1998, the bit when I traced its origins back to a French folk dance was expunged from my copy; in Malaysia they don't believe in history, just projecting the present on to the past. (The final irony came a few weeks later when an innocent gentleman from Johor heard an old record of Hawaiian dance music and realised the tune being played was actually the Malaysian National Anthem. He wrote to The Star to express his dismay at hearing the anthem being so belittled, but in truth the recording had been made long before Malaysia ever came into existence.) What matters with national anthems are the words; although how anyone can get a hefty dose of national pride when they sing the wordless anthem of Zanzibar, where the weird music itself is by none other than that archetypically British author of Essays on Musical Analysis, Donald Tovey (and in an ironic twist of fate his March for the Sultan of Zanzibar defies analysis). If it's nationalism in music you are after, you will rarely find it in a national anthem. Vaughan Williams published as essay called National Music in 1963. He began with the premise that all music has national characteristics – "some misguided thinker has described music as the 'Universal Language'. It is not even true that music has a universal vocabulary" – and goes on to suggest that "the outburst of artistic nationalism in the early 19th century appears to me to be the natural reaction of the artificial carving up of Europe to suit the needs of Emperors and politicians after 1815". I have his comments in mind as I prepare the concert notes for a performance to be given by the Hong Kong Philharmonic on 14th and 15th October. They devote the first half of their concert to two composers who certainly did respond to the carving up of Europe during the 19th century by forging a musical language purposefully incorporating elements as drawn from the folk music of their respective motherlands to create a "nationalist" idiom; certainly one cannot write about either Sibelius or Grieg without mentioning their nationalist endeavours. 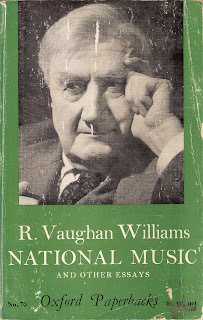 For Vaughan Williams, while folk music and similarly obvious nationalist elements might have some novelty factor, the real lasting nationalism in music comes not from a deliberate inclusion of folk melodies but the centuries of ingrained heritage behind every composer. He writes; "When Stravinsky writes for the chorus his mind must turn homeward to his native Russia with its choral songs and great liturgies of the church". So, he argues, it is through Stravinsky's style of writing for the voice rather than any superimposed Russian folk elements, that "we find the real and the great Stravinsky which will remain fresh and alive when all the clevernesses of his instrumental music will have become stale through familiarity". Whether the Firebird – the work which concludes the HKPO concert – has yet become stale through familiarity is debatable, but in the meantime it certainly possesses a very strong sense of Russian nationalism. We can wave our flags, even stick them up outside our flats or on the windscreens of our cars, but true nationalism only comes from centuries of collective heritage and experience. I think Singapore, Malaysia and all the other nations of the world who so proudly celebrate a few decades of independence, might do well to learn from the continual evolution of classical music. Happy Birthday, not just Singapore, but also that fine pianist Solomon (1902-1988) and the French/Venezuelan composer/conductor Reynaldo Hahn (1874-1947). Malaysian Organ News - The Final Chapter?